The 2013 Chevrolet Malibu Turbo will be sold in more than 100 countries and has gone through some extreme testing to be prepared for its global launch this month. The all-new 2013 Chevrolet Malibu Turbo is ready to handle its new mission to be a global car. It is arriving this month and has gone through some of the most severe testing to get it ready for extreme temperatures around the globe. The new Malibu mid-size sedan is getting an all-new 2.0-liter turbocharged engine that will infuse the car with a new global spirit and Chevrolet wants the car to be ready to handle this new challenge. Engineers got the new Malibu Turbo ready by putting it through some extreme tests. 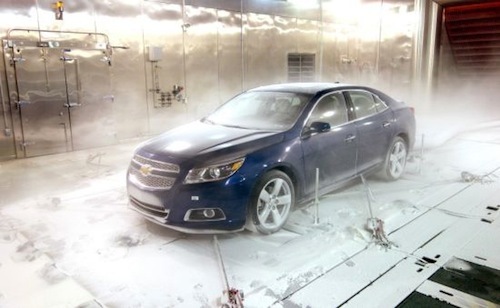 The testing has taken place in the General Motors Climatic Wind Tunnel located in Warren, Mich. where the new Malibu Turbo has endured everything from sub-zero conditions to temperatures of up to 140 degrees. The new mid-size Turbo sedan will need to be able to handle a wide range of real-world conditions. The new 2013 Malibu Turbo will be sold in more than 100 countries around the globe and the Climatic Wind Tunnel simulted those conditions the new car from Chevrolet will likely see. The 2013 Malibu Turbo was subjected to blizzard and hurricane conditions inside the wind tunnel, where temperatures went from 40 below zero to 140 degrees under 1,155 watt lamps to simulate extreme sun-baked conditions. It also went through 150 mile winds to simulate blizzard and and hurricane conditions inside the facilities wind tunnel. The wind tunnel also simulates actual driving conditions and allows the car to experience speeds of up to 155 mph. The new Malibu turbo should be ready for its global debut and buyers around the world will be drawn to the mid-size sedans capable powertrian. The 2.0-liter turbo engine produces 259-horsepower and 260 lb.-ft. of torque. The sporty sedan will sprint from 0-60 mph in 6.3 seconds and achieve a top speed of 155 mph. The Malibu turbo has an EPA-estimated fuel economy of 21 city and 30 mpg highway. Global buyers will also get a new car that features four-wheel-independent suspension system, hydraulic ride bushings, and a premium electric steering gear. In the U.S., the base 2013 Chevrolet Malibu will start at $23,150 in four-cylinder LS trim including a $760 destination charge. The 2013 Malibu also comes in 1LT trim ($24,765) 2LT ($26,000) and the 2013 Malibu LTZ ($28,590) is the top trim level. Watch the 2013 Malibu Climatic Wind Tunnel Testing video below.